This dissertation presents a study on the acquisition of telicity by Spanish and English native speakers. In addition to the study of acquisition, it investigates the syntactic and semantic properties of locatum constructions (e.g., the water filled the bucket), which are sentences that contain two internal arguments and whose subject is non-agentive. 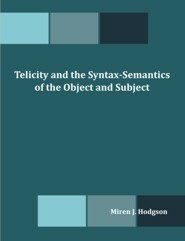 This dissertation explores the syntactic and semantic properties of elements of the verb phrase that had not been previously considered in the interpretation of telicity, such as the role of non-agentive subjects and the type of movement that takes place in the checking of the verb's telic features. Contrary to the assumption that only the direct internal argument of the verb can delimit an event, I argue that objects generated in the lower verb phrase, by virtue of being an internal argument of the verb can delimit an event. An object delimits an event by checking the verb's telic features in spec-AspP, either by covert or overt movement. If a predicate contains one internal argument (e.g., the boy filled the bucket) the checking of the verb's telic features takes place via covert movement. That is, only the NPs specific quantification features move covertly to check the verb's telic features in spec-AspP. However, if the predicate contains two internal arguments (e.g., fill the bucket with water), the surfaced subject (e.g., the water filled the bucket) by virtue of being an internal argument of the verb, checks the verb's telic features as the category and its features move overtly to subject position. The study shows that young children understand telicity when the verb's telic features are checked via overt movement, but have difficulties understanding telicity when the verb's telic features are checked via covert movement. I propose that predicates whose telicity involves overt movement should be acquired earlier than predicates whose telicity involves covert movement because overt movement is an operation that happens between D-structure and S-structure before the sentence is pronounced. Predicates whose telicity involves covert movement might be acquired at a later age of development because covert movement happens between S-structure and LF after the sentence is pronounced.